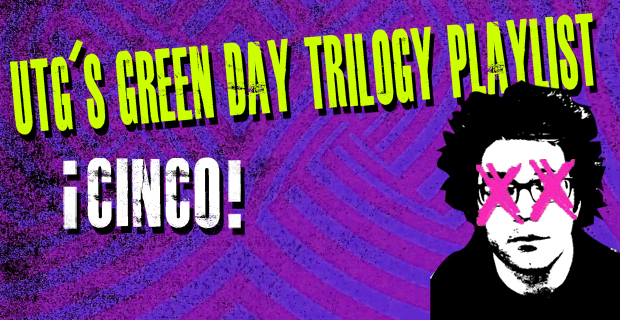 Green Day had a huge undertaking with their recently released trilogy of albums, ¡UNO!, ¡DOS!, and ¡TRE! (click on each album for our individual review). Not only did they have to produce a quality record at their age (because let’s be honest, bands like this do generally get worse with age), they had to produce three of them. Green Day wanted to take a more relaxed approach to writing this record, and didn’t want to create huge concepts like their last two albums, but instead they just increased the scope by giving themselves the task of keeping the listener interested and engaged over a grand total of 37 tracks. Unfortunately, the general consensus among the UTG staff is that they did not achieve this goal. There are definitely hits on these records, but there are also a lot of forgettable misses as well. So we at UTG decided that we’re going to share with you what we think Green Day should have put out. ¡Cinco! spans all three of the releases, and makes what would have been a cohesive, badass record. The problem with the trilogy wasn’t that the songs were all badly written, they just all sound too similar to the point where everything kind of blends together and you get bored. What follows is what we believe would have made the best possible record Green Day could have put out given the 37 tracks they have released over the past few months. So kick back, relax as much as any punk fan can, and let us introduce you to Under the Gun Review’s newest playlist, ¡Cinco! You can check out our picks and stream ¡Cinco! after the break via Spotify. If you think we made a mistake with our selections, comment below and let us know! Keep the ones you have, but add ‘Sweet 16’, ‘Rusty James’, ‘Nuclear Family’, and ‘The Forgotten’. Trust me, give them another listen. I appreciate them beautifully. Especially ‘Sweet 16’ and ‘Rusty James’. They just have a 60’s feel to me…. I know it’s been popular to make your own playlist and that’s cool. Mike Dirnt even said people would do this. But for anyone to say that THEIR playlist is the one that would have been good is both unfair and pompous. Right off the bat I see you left off Oh Love, I know I’m in the minority but I have to have that one. I love that song. I like Amy but I’ll take THe Forgotten over it. But guess what, we don’t have to choose! They are both there to listen to and enjoy. Well I have devised my very own ‘Cinco’, and it differs quite a bit. 1,2,3,4,8,10 are the only ones I’d keep. Actually, I’m going to have a play now! Seriously, I challenge anybody to have the same 12 songs. There is such a vast array of styles and songs in the trilogy, no ‘Cinco’ will be exactly the same. Well, on the law of averages there would be some, but you get what I mean!